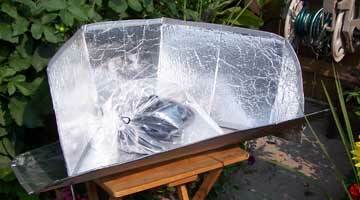 Building and using a simple cardboard solar cooker. This solar oven can bake. 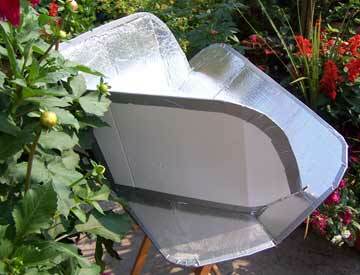 Solar cooker is made from an old cardboard box. I taped the edges with duck tape. This is the back. On the front face the duck tape helps to attach aluminium foil . I also used rubber cement to stick the foil down. There are 2 slots cut into the lower panels. The 2 tabs that stick out higher up fit into the slots. The top part and lower part are only connected by a short section in the middle where there is extra tape. 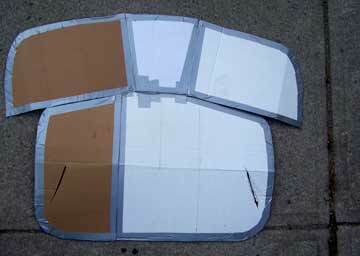 This allows the solar oven to fold there. The lower section of the cardboard is folded just above the slots. The protruding ends fit into the slots and hold the solar oven together. I've seen many different experiments and designs for the simple ovens. I've even seen people using a sort of funnel made from a car window shade. The kind that people put in the front window to shade the car and reflect some of the sunlight out. They are available from the dollar stores. I don't think the shape of the funnel is critical and many variations will work more or less. 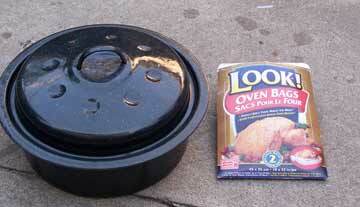 Small black roasting pan and oven bags. These bags don't melt in the oven. They are designed for cooking. The roasting pan heats up faster if it's not thick. It should be black or very dark. Set up of solar cooker is complete. Food is in black roasting pan, the roasting pan is in the plastic bag with some air inside. There are 3 half inch stones keeping the pot from touching the bag and makes a space under the pot. This allows warm air to circulate around the roasting pan and insulates it. The bag is closed using a metal twist tie. The solar oven is facing the sun. As the sun moves it's good to move the set up so it faces the sun. I did this every half hour or so. This is what I cooked in the solar oven for my first experiment. 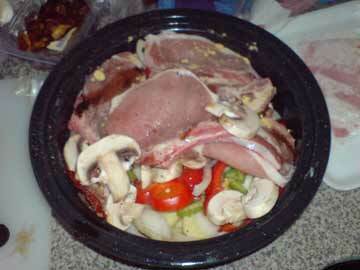 Some veggies on the bottom and meat on top, flavoured with soy sauce, salt and pepper. The sun is out but a bit hazy. The sun was quite weak after the first hour. 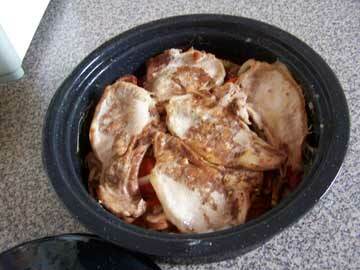 The food was cooked but I would have preferred to leave it in the oven a bit longer. This was very successful for a half hour solar oven. I try to be accurate and check my information, but mistakes happen, especially to me. Box style cooker have proved themselves reliable. They have quite a large capacity too. The vacuum tubes add a new dimension to solar cooking. This stove can get very hot quite quickly but the cooking volume is not huge. If you only want the tube it is also available. My brother has experimented with these as a solar water heater. He was impressed. Similar style to the one I've built but better finished and easily portable. Large and powerful, can be used to fry foods. Instead of matches, a solar fire starter.